You don’t like the spicy? | Are You Zhazha? You don’t like the spicy? 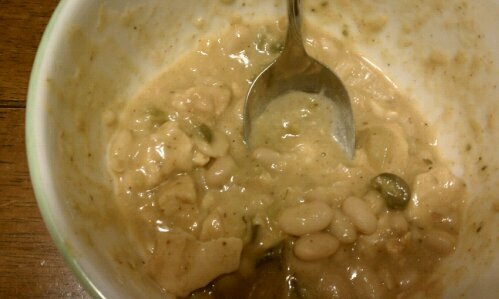 I made some new “White Chicken Chili” tonight after hearing my boss talk about it and it was so spicy YUM. I didn’t have the recipe his wife made but I tried this one and it was so incredibly hot that I just couldn’t pass up the opportunity to capture Andrew’s gasp-filled struggle through his one half bowl. Even I thought it was hot and I love me some inferno foods! "What did you put in this?!" "You had to make this spicier than it said to be." "Are you taking pictures of me suffering?" Are you too chicken to try the chicken chili? I have a feeling I’m the only one who will be eating the leftovers. Next time, I’ll go easy on the spicy.